You can sense a pattern with these reviews: The Junk King crews are helpful and friendly. They are focused on getting rid of all your unwanted clutter, no matter what it takes. Many Junk King customers are pleasantly surprised at how fast Junk King operates. Once you make the decision to get rid of your junk it won’t take Junk King long to make that happen. From start to finish, the best approach to any time of rubbish removal is to give that job to Junk King Palm Beach. This entry was posted in Palm Beach Junk Removal and tagged Junk King, reviews, Rubbish Removal on April 29, 2018 by Junk King. Last updated April 29, 2018 . Everything in your home could fall into one of three categories: Useable, broken or trash. The useable items are the things like furniture, appliances, clothes and anything else that gets used at least once a day. Broken items might be those things that you think you might get around to repairing someday. They could also be things that have been replaced by new models. That applies to computers and televisions. Then there is the trash. A lot of broken things could end up as trash but not every trash item has to be broken. You might be done using an old lawnmower or futon. This is something you want to get rid of. That makes it trash. The best way to take care of a heavy trash pickup is to turn that task over to Junk King Palm Beach today. The moment you designate something as trash, you don’t want it around your house. It is taking up space and might even be a safety hazard. One call to Junk King can make that trash item disappear for good. The heavier something is, the more of a challenge it becomes for you to move. Even if you tried to get it down to the curb, you could end up straining your back or scratching up your floors. None of that is going to happen with Junk King doing the work. You won’t have to lift anything except your finger. That will be used to point out all the stuff you want taken away. Those objects could be situated all throughout the house. Junk King doesn’t need them to be in a pile on your driveway. If you’re ready to get rid of your heavy trash items, then make that call to Junk King. You’ll be happy with how fast they respond and can schedule your appointment. 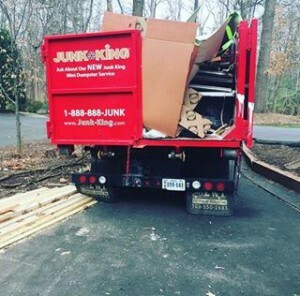 Often you might find that Junk King is available for a heavy trash pickup on the same day that you call them. That is how fast you can get rid of your rubbish. 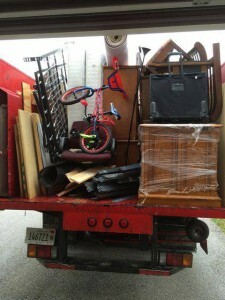 Thanks to Junk King Palm Beach, heavy trash pickup is no long complicated. One call gets it done. This entry was posted in Palm Beach Junk Removal and tagged heavy trash pickup, Junk King, junk removal on April 21, 2018 by Junk King. Last updated April 21, 2018 . If you haven’t invested in a squeegee yet, then now is the time to do it. They make cleaning windows inside and out a lot easier. You should also give attention to the window tracks. Accumulated dust and grime can build up and prevent easy opening. An old toothbrush is a good tool to use in these areas. Vacuuming is always part of cleaning but for spring cleaning, you’re going to want to take your vacuuming to the next level. Be sure to target baseboards, moldings, ceilings and walls. If you have area rugs and/or carpets, then you should consider renting a carpet cleaner from the grocery store. Same effort as vacuuming just a lot more deep cleaning. Just note if you are using a carpet cleaner that things will need to dry out. Perfect excuse to open up those newly cleaned windows! Spring cleaning is when you should change the batteries in your smoke alarm and carbon monoxide detectors. You should also make sure your fire extinguishers aren’t expired. If you don’t have extinguishers, then now is the time to get them. If you have a backyard, then you have a chance to hang up blankets and curtains to air them out. If you wash them, then still hang them out to dry. Bring the vacuum cleaner into the kitchen and use it to vacuum the back of your fridge and freezer. Those vents need to be kept clear of dust to prevent overheating. You should also carefully slide out your stove and fridge, without unhooking them, in order to get at any grease or dust. Once you’ve cleaned all through the house, you will probably have a new list of things that need to be tossed out. This when you want to call in Junk King Palm Beach. The two-man moving crew will swiftly go through your entire home and pick up all the stuff you want to get rid of what on the spot. That will make a positive impact on your living space. The best way to finish your spring cleaning is to set up a junk removal session with Junk King Palm Beach. Get rid of rubbish once and for all. This entry was posted in Palm Beach Junk Removal and tagged Junk King, junk removal, spring cleaning on April 1, 2018 by Junk King. Last updated April 1, 2018 .